Chris: Amateur Traveler episode 438 to Amateur Traveler talks about crabs cake, the national aquarium, and one really big flag as we go to Baltimore Maryland. Welcome to the Amateur Traveler. I’m your host, Chris Christensen. This episode of the Amateur Traveler is again brought to you by BloggerBridge. If you’re a company and you want to connect with content creators, bloggers, podcasters, videographers, and writers check out Bloggerbridge.com. One big announcement that I didn’t want to bury at the end of the show and that’s the Amateur Traveler specifically the Amateur Traveler podcast that you are listening to won a Lowell Thomas Travel Journalism award last week. I was very pleased and maybe a little surprised. I happened to be attending the Society for American Traveler Writers Conference, and so I was there when the awards were announced, which was a nice bonus for my trip to Iceland. I like to welcome back to the show Nancy Parode. 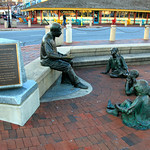 Nancy writes about Senior Travel and Boomer Travel at About.com, and has come to talk to us about Baltimore Maryland. Nancy, welcome back to the show. Nancy: Thanks for having me back. Chris: And I say welcome back to the show Nancy was on talking about the region outside of Rome but we are going domestic this time. I put out a request for who knows Baltimore, because we had one of the listeners of the show said, can you tell me more about going to Baltimore? So why should someone go to Baltimore? What’s your connection to Baltimore, Nancy? Nancy: Well, my connection to Baltimore is that I lived in the Baltimore area for a total of about 12 years. We moved here initially with my husband, who is in the military, and it’s pretty much become home to us. My son was born in Maryland, and my daughter is less than two when we move here, so this is for all intents and purposes are home. We do a lot of sightseeing in Baltimore. Nancy: Baltimore is close but we went to all the museums and such in DC and they sort of skip it and I think they’re really missing out it’s a neat place to visit. Chris: And I will confess that I have spent a very little time in Baltimore because I was in DC and there are all the museums there. Nancy: Right, so we are going to change your mind. Chris: Exactly, we basically went up there when I was a kid, when I was I guess I was only 17 when we went to the East Coast for the first time for our big bicentennial tour and we went up to see Fort McHenry and that’s really all I have seen in Baltimore. And when you say food, I think crab cakes, and that’s all I know about Baltimore. So what should I know? What should people do when they are in Baltimore? What kind of itinerary would you recommend? Nancy: I would definitely say that Fort McHenry is a must see spot. “The Star Spangled Banner” just celebrated its 200 anniversary in Baltimore, so Fort McHenry has a beautiful new visitor center that you start at and you can watch film and then you can go and explore the Fort. They have great Park Service Rangers out there, who can really give you a sense of what it was looks like to be there during the Battle of Baltimore, when Francis Scott Key wrote “The Star Spangled Banner” from a vantage point out in the harbor and give you an appreciation for how important the American Flag is to our country, what is the flag, what is the symbol, and that’s everything. They call it the flag talk actually and it’s worth going just to be part of the flag talk. I always tell people go in the Fort is for opening and the closing because then you can help put up or lower the replica Star Spangled Banner flag that flies over the Fort. Chris: And they are flying one because I remember that the Star Spangled Banner that they flew at that time was a huge, huge flag. Chris: We are not talking about a normal size flag, so they are flying a replica of that. Chris: I could well imagine. Yeah. Nancy: But even so the smaller replica is still big enough so it requires many, many people to help unfold it, and get it to the flag pole, and it’s really a neat thing to do, to be part of that. So I highly recommend Fort McHenry, and it’s easy to find, and there’s a parking there if you have a car. If you don’t have a car, one fun way to get there is to water taxi from the Inner Harbor area, so it does stops at Fort McHenry so you don’t even need to have a car to get there. Chris: Excellent, and for those who are not familiar with their American History, some of our foreign listeners, or those of you who fell sleep in school. We’re talking about the Battle of Baltimore being when the British has already just burned Washington DC and burned the White House and we’re coming up to Chesapeake in the War of 1812. Chris: In 1814 and they were stopped by this one stubborn little fort here that wouldn’t let the Navy sail pass. It wasn’t that they . . . the Fort really could do much damage to the British, as I recall, because I don’t think they had guns that had the range but they wouldn’t lower the flag. They didn’t surrender, and so eventually the British did sail off. Now, there’s one quirk besides being a really big flag about the Star Spangled Banner that they flew over that. The flag had 15 stripes. At that time that was the last flag where they added both a star and a stripe. Nancy: Right, for every new state. Chris: They decided 15, which starting to head to [ten] stripes, so. Nancy: Probably because it was so hard to fly the flag on windy days, actually. Chris: But yeah. Once they added the 16th state they went to just 13 stripes. Chris: And that’s has been the same ever since. Excellent. What else should we see besides Fort McHenry? Nancy: Well, if you are a history buff I would also suggest going to the Star Spangled Banner Flag House, which belong to Mary Pickersgill who was the seamstress who actually created the Star Spangled Banner. They have some nice exhibits there about the War of 1812. They have good children programs. It’s a very small place. It’s kind of near the Little Italy neighborhood, so it’s easy to get to on foot, by a car if you don’t mind parking in a parking garage in Little Italy and walking a couple of blocks. So, for history, there’s a lot to see. Another neat thing in the Inner Harbor area that’s often overlooked is the USS Constellation. Nancy: I’m partial to this to this because my husband is in the Navy, so. Chris: Sure, it’s sister ship to the Constitution. “Old Ironsides”. Ship. This Constellation was actually built in, I believe, 1853. The keel was laid somewhere around there. It saw active service starting in 1854, so she participated in the Civil War, various blockades, she was a training ship for the Naval Academy, and is now a beautifully restored museum right in the Inner Harbor, so it’s a fun thing to do. You can explore the whole ship, they have great tour guides, and it’s a nice little historic diversion if you don’t perhaps have time to get all the way over to Fort McHenry. Chris: Now that’s built just at the end of the Age of Sail just prior to the beginning of the Age of Steam, so it’s a sailing ship? Nancy: Yes it’s a sloop. Chris: Okay, just checking. Right around that time the ships changed dramatically. Chris: But I thought that would be just before that. Excellent. What else will you recommend? While we’re in the Inner Harbor area anything else we should do? Nancy: Oh yes, definitely. The number one tourist attraction in Maryland is the National Aquarium at Baltimore. It’s what we in Baltimore think of as the far end of the Inner Harbor the Eastern end. It’s an excellent aquarium. I’ve been to many around the US and this is certainly one of the top two or three I’ve ever been to. I spent a lot of time there. It’s fun for kids. It’s fun for adults. It can get a little busy on the weekend, so I would suggest to people that if you going on a Saturday or Sunday, you try to get there when it opens. They have reduced rates on Friday nights during the summer, which is nice if you just want a quick visit and you want to save a little bit of money but whenever you go there’s so many neat fish to see and other aquatic creatures. They have a relatively new exhibit there that is called the Blacktip Reef and it’s filled with blacktip reef sharks, so if you are a shark person this is the place to go. Chris: Now you mentioned the end of the summer that being busy. When do you recommend? Clearly, you get most of your tourist in Baltimore area in the summer but when is the best time to travel in Baltimore? Nancy: Well, I’m always partial to fall travel because here the humidity is gone, a lot of the crowds are gone, but you still have the warm sunny days, and it’s not too cold at night. It can be a little bit crisp starting in the mid-October. There isn’t really a bad time to visit Baltimore. They are pretty good at snow removal if you have to be here in winter time. Chris: When you mean snow removal, you mean that inch of snow that Baltimore [inaudible 00:09:17]. Nancy: No, we have had some pretty hefty snow years recently. You may have heard about the Snowmageddon in the DC area. Well, a few miles north we got it too, but some winters we get almost no snow and some we get many, many inches. It’s very unpredictable but you can easily visit just about every attraction in Baltimore in the winter time too. Summer is fun because the weather is warm and pleasant. They have outdoor concerts along the Inner Harbor area along the piers there, so it can get a bit busy at night on weekends when they do that, but it’s very festive and fun. Spring is beautiful here. A lot of the fruit trees and so on bloom and just as they do down south [inaudible 00:09:59] Potomac River. Chris: Like the cherry [inaudible 00:09:59]. Nancy: Yeah, we don’t have cherry blossoms festival or anything like that up here in Baltimore. That’s definitely the District of Columbia’s prerogative, but it is a very pretty season here in Maryland too, so there really no bad time to come. Chris: Is there a particular day of the year that is particularly good, a festival, or anything special that you . . .
Nancy: Most holidays have really nice festivals. I’m partial to Fourth of July at Fort McHenry. They really do it up there. They have special programs all day long, so if you are wanting to get some of the patriotic spirit, that’s a good time to go. They have a huge St. Patrick’s Day parade the Sunday before St. Patrick’s Day and that’s really fun event. Chris: I recall it being one of the top five in the country. Am I wrong when I say that? Nancy: I don’t know how it stacks up in terms of size, or ratings to, I mean of course New York City has a fantastic parade and there are other cities that have good parades too. There’s a lot of community spirit at the Baltimore, St. Patrick’s Day parade and I get to say that from experience because my daughter is in it every year so that’s a fun thing for me. But there are many, many Irish groups here and Irish dance schools. Mummers comes down to Philadelphia to participate every year, Irish wolf hounds, puddles dyed green. If you are looking for something that is fun and community oriented, that’s a great parade to come to. Chris: Excellent. You mentioned mummers and I know we talk a lot of that before, but just in case somebody doesn’t know what a mummer is. Chris: Did the mummers come down with the dadders? Nancy: No, the mummers are group of musicians that come down. It’s a Philadelphia tradition. They are dressed in very brightly colored strange looking costumes that are hard to describe. They’re not exactly clowny but they kind of are. They are very colorful and they look a little bit like they should be ragtag but they’re made of nice materials and they play different instruments and marched around. It’s a fun tradition that’s really hard to describe without visuals because I can tell you that the costumes have fringy things hanging off them and they have funny hats. Each group of mummers dressed as the same so that there’s sorts of a rivalry that’s kind of reminiscing of the krewes in New Orleans if that makes sense to you. But it’s just a very different tradition and every year I’m standing along the parade route and everybody’s going “who are those people,” because if don’t know anything about Philadelphia, you probably don’t know what mummers are. Chris: And then anybody who wants to hear more about that we have done a show on Philadelphia way back in our archives, so you can hear more about the mummers, but I just didn’t want to gloss over that and assumes that remembered that show that we did eight years ago, or whatever it was. Chris: Excellent, what else should we see. We’re still in the Inner Harbor? Nancy: The Maryland Science Center is a fun science museum that is at the southwest end of the Inner Harbor and in between there and the National Aquarium area there’s a shopping and eating complex called The Harborplace. A lot of tourists go there but a lot of locals go there too, so if you’re looking for a quick bite to eat, or an interesting shop to stick your head in and look around, that’s a fun place to go. Kids like the candy store there very much, parents be warned. I mentioned the water taxi. This is a good way to get around Baltimore if you don’t have a car and you’re trying to get to tourist sites is because they got the taxi route set up to go just about anywhere you would want to eat or shop that is accessible by water starting with the Inner Harbor then going over to the Fell’s Point neighborhood to the Fort McHenry, as I mentioned, at different spots around the Baltimore’s Inner Harbor area. Chris: We’re moving on from Inner Harbor to where then? Nancy: Well, I guess I want to mention if you think about . . . ? Chris: I think we just took a water taxi to Fell’s Point, so I wasn’t sure. Nancy: Yeah, well we can do Fell’s Point. Fell’s Point is a neighborhood that was originally part of the Port of Baltimore way back when, so there are still piers there. The main drag in Fell’s Point is called Thames Street and there are lots and lots of restaurants and pubs and eclectic little shops. If you want to sort of place to spent an afternoon shopping and dining, hanging out with friends, enjoying the beautiful weather, Fell’s Point is a really neat place to go. It’s also one of the main nightlife areas in Baltimore, so if you want to go out in a weekend evening, that could be one area I will definitely recommend. Chris: Excellent, and then you are taking us someplace else before I diverted you. Nancy: Oh, I was taking us back towards Fort McHenry actually across from the National Aquarium area along the Key Highway, there are a couple of museums I didn’t want to miss. One is the Baltimore Museum of Industry. Baltimore has always been of course an important port city and a city of many different type of industries everything from fish packing, the railways, all kinds of things, and that museum showcases that aspect of Baltimore’s history. But then there’s also my favorite museum in Baltimore and that is the American Museum of Visionary Art. This is a museum like no other. I’ve seen it describe as a folk art museum and that is not exactly how I would describe it. The common denominator for this museum is that every piece is on exhibit at the museum was created by someone who’s never had a formal art training. Nancy: That’s the only common denominator. Nancy: I’m like [inaudible 00:15:17] out. So if you think of adjectives like “eclectic,” and “unusual,” and “fascinating” that is the American Visionary Art Museum. And you don’t always know what you going to see because they have many changing exhibits. Last time I was there I saw an exhibit of hand pieced quilts with embroidery on them that have been done by someone who had to go into hiding from the Nazi’s because she was Jewish. She hid with her sister and she chronicled all of these events on these enormous quilts, and then they had a video that you could watch to better understand what their experiences were like and what happened. Previous to that exhibit, the previous time I was there, I saw an exhibit in the same space that is all about pieces made from reclaimed household material, so someone had smashed dishes and made mosaics out of it out of them. Baltimore has a long history of painted window screens and somebody had sort of done a take on that using reclaimed doors and painting them, just very interesting things. Another exhibit I saw one time was a whole bunch of posted notes where people put their secrets on them and you could read them. Chris: Oh, I think I have seen an exhibit like that, yeah. Nancy: Another person had done tiny, tiny miniature paintings of just about every famous painting in Western art that you can think of. Dozens and dozens and dozens of them. Of course, the exhibit wasn’t that large, because these were all like one by two inch replicas of Starry Night, and the Mona Lisa, and so on and this person had never had art training, hadn’t gone to art school or anything like that. They were beautiful tiny little replicas. It was really amazing. Nancy: So, definitely it’s a fun place to go. Chris: And you mentioned in your list of things that Baltimore is known for the railroad and many people may be surprised that they actually know the name of the railroad that used to go into Baltimore without realizing it because it’s one of the squares on Monopoly. Nancy: Monopoly, exactly. The B&O Railroad and there’s actually the B&O Railroad Museum in Baltimore. If you are train buff, this is definitely must see stop. Nancy: Occasionally they will also get this special Thomas the Tank engine train to come in there for the younger set of railroad buffs, so if you want to do something like that, you have to look on their website and see when that might be happening, whether or not Thomas is there. If you like rolling stock and you like railroad history, this is a great museum. They have a round house so many of the locomotives are in the round house and you can walk right up to them. And they are a good museum for kids. They have a lot of children programs throughout the year. It’s really fascinating and there are lots of neat photo opportunities too because you can get so close to the trains. Chris: Excellent, excellent. There’s a train museum out here in Sacramento. We need to do an episode sometime on Sacramento that there’s a truly outstanding as well. Cool, where should we go next? Nancy: Where should we go next? Let’s see. Chris: I tell I’m getting a little hungry by this time with all the walking we have done and you mentioned food at the beginning and we haven’t paid off that yet. Chris: So, I know the crab cakes. Nancy: Yes, Baltimore is famous of course for its seafood and crab cakes are sort of the state dish of Baltimore, of Maryland all together. Every year there are competitions in various crab related areas. They have crab soup competition, they have crab cake competition. There are secret family recipes. Each restaurant has its own way of doing things. So, if you are looking for crab cakes, a local chain of restaurants here is called Phillips and they have their flagship restaurant in the Inner Harbor. It’s in the building called the Power Plant because it used to be a power plant sort of near the National Aquarium and it’s one of many restaurants in that building. But certainly if you are looking for some place near the Inner Harbor where you can be assured of getting a good crab cake, I would definitely send you there. In the summer time, they have a crab deck, so you can go out and indulge in the other Baltimore tradition of crab feasting where you spread out newspapers on a table and dump a bushel of crabs on and get a hammer and bash them open and pick out your food. It’s a very Maryland thing to do. Chris: Excellent. But what else do I not know about Baltimore food? Nancy: What you don’t know about Baltimore food is how diverse it is. Nancy: One of my favorite places is actually also listed as the top restaurant on TripAdvisor the last time I checked it, and it’s a restaurant that’s only open during the day and it’s not open on Sundays and it’s not in Little Italy, or the Inner Harbor, or anywhere that you’ve ever heard of. It’s called Dipasquales and it’s actually a part of an Italian grocery store in an area called Highlandtown. So you would have to drive here, or take a cab. It’s not water taxi accessible but they have fabulous, fabulous Italian food. I get to say that because I lived in Italy twice. It’s worth a detour and if you love Italian cookies, or Italian cheese, or Italian wine, that is a good place to buy those things as well. So, I do sent people there often, even though it’s definitely a day time stop. We have lots of Italian restaurant in Baltimore because there is a Little Italy section. Nancy Pelosi grew up there. Nancy: In fact, there is now a street name for her there, but there are many good restaurants there to choose from, but we also have non-Italian food. You may not know that we have a very well-known Afghan restaurant in Baltimore. It’s called The Helmand. It’s in front the Mount Vernon area. And it’s owned by the Karzai family and if that name rings the bell. Nancy: Because the owner is the brother of Mr. Karzai who used to be the, I believe, Prime Minister of Afghanistan until just now. Nancy: So, that’s it very well regarded restaurant and it’s not something that you would perhaps expect in Baltimore. Chris: And so meat kebabs, rice and those sort of things? Nancy: Yes and also a few traditional Afghan desserts. They change their menu around now and again but it’s definitely worth your time to go and it’s a high end restaurant, so save your money but it’s worth it. Another thing that we have a lot of is Irish Pub type of restaurants. I mentioned the large numbers of Irish groups and people in the Baltimore area, so there are quite a few pubs around in the Harborplace at the Inner Harbor. Tir Na Nog is the Irish pub of choice. But there are also a lot of pubs near the ballpark and the football stadium, which are not terribly far few blocks walk from the Inner Harbor area, so you can go to the Pratt Street Ale House and have a nice meal if you are looking for pub grub. And it’s very traditional pub grub. They have shepherds pie and fish and chips, and that type thing. That’s usually where we go after the St. Patrick’s Day Parade is over actually. And there’s another pub near the ballpark called Pickles Pub, which is green on the outside and it’s kind of fun atmosphere. Chris: Well, and you mention the ballpark, which we should really give a nod because . . .
Chris: Camden Yards, which is the Oriole Ballpark there really changed in a very positive way the whole process of designing ballparks across the US and it became really the instigation for a lot of things like the park that I enjoy AT&T Park up here in San Francisco really have to give an nod to what they did in Camden Yards Ballpark, which make an old style ballpark. Nancy: Yes, they did. I was lucky enough to be able to go to games the very first season it opened and when it was a brand spanking new ballpark and we still go as often as we can and it’s still a beautiful ballpark. Camden Yards was designed to give that old time feel that people were missing in baseball. I grew up in Dodger country, and Dodger Stadium is another place that hasn’t change since I was a kid. But it doesn’t look anything like Camden Yards. Camden Yards has a lot of green space and it’s architecturally planned to take advantage of the older brick buildings in the area and the new structures that were put up around Camden Yards were designed to blend in with that. They have a really nice picnic area. I have never had a seat where I couldn’t see what was going on and I’ve sat all over the ballpark. It’s just a really comfortable fun place to go to watch baseball. Adjacent to that, they share a parking lot as M&T Bank Stadium where the Baltimore Ravens play. East Coast rivalries, they’re really fun to participate in though you can wear Red Sox t-shirts to Camden Yards and you’ll be perfectly fine and you’ll have plenty of company. Chris: And perhaps some spirited discussion. Nancy: It’s fun and it’s nice because Camden Yards makes you feel like that. Nancy: You just feel like, “hey take me out to the ballgame,” and it’s a nice place to watch a ball game. Chris: Excellent, what else should we see in Baltimore? Nancy: I did mention the USS Constellation. There are some other historic ships in the Inner Harbor if you are of a nautical bent. There’s a Coast Guard Cutter and Chesapeake Bay lightship and a submarine. The ticket for that is part of the ticket for the USS Constellation, so you have to walk from one of those areas to the other to see all of the ships involved. But those are there, the historic ships. Another fun thing to do even though it sounds super touristy is to take a Baltimore Harbor cruise. Local companies often will do that for say holiday lunch parties or team buildings exercises, that type thing, so it’s not just a tourist thing. There are some trips during the summer time that take you out by the Fort McHenry and do the historic narration version of the trip and there are others that are like a brunch cruise or at night dancing or what have you. But it’s just fun to get out on the water and the water is so much a part of Baltimore and of Maryland history. When you get out on any part of the Bay, you just feel a little bit more connected to the local areas, so that’s definitely a fun thing to do. If you don’t have time for that, you can always rent a dragon pedal boat near the National Aquarium and do your own pedal boating around Inner Harbor for an hour, or so, and then you’ll probably be hungry and want more food. Chris: What do the guidebooks recommend that you would say it’s just not really worth the time? Nancy: A lot of people make the pilgrimage to Edgar Allan Poe’s grave site, which is in Baltimore, or he lived in Baltimore too, the Edgar Allan Poe House is here. It has struggled because it’s in disadvantage neighborhood and that the city cut its funding quite a few years ago, so they’ve really struggled, and at the moment, I believe, they’re only open are on the weekends. If you don’t know your way around Baltimore, you might want to skip those just because they’re a little bit harder to find and you might not necessarily want to walk to them. But if you’re literary buff, or you love Edgar Allan Poe, or you’re a big fan of horror and mystery stories, then it might be worth the pilgrimage, so it’s definitely a personal choice. Chris: Okay, and you mentioned a disadvantage neighborhood, which really means that we have to talk about a little bit of crime because Baltimore has a little bit of a bad reputation with that. Chris: Any recommendations, or an advice in terms of Baltimore from that point of view? Nancy: If you are in the area where in the tourist attractions are, you are not going to have any big problems. Baltimore is relatively large city and so there are going to be some big city problems here. If you stay around the Inner Harbor, Fell’s Point, Canton which is a little bit farther east than Fell’s Point, Locust Point where Fort McHenry is, I think it you’ll be just fine. I’ve never felt anything bad was going to happen to me and I drive around there, and walk around there, and so on. There are some areas in Western Baltimore and some areas in Eastern Baltimore where you might be more of a target for a crime, but if you just use big city common sense, don’t go wandering around by yourself at two o’clock in the morning, have a designated driver if you’re driving, and do all the things that you do in any other the big city, you should be just fine. Chris: Okay, you had mentioned night life and we haven’t delivered on that yet. Nancy: This is an area where I don’t spend a lot of time as a working mom going out to bars and what have you, but there are plenty of them. As I’ve said, Fell’s Point is definitely is one of the top areas to go to. I mentioned that Canton neighborhood, that is a very much up and coming part of Baltimore there. There are many areas in Baltimore actually where people have rediscovered the city, maybe they group in a family that have move to the suburbs but they work in Baltimore, and they discovered that it’s really nice to live close to work in an area that is growing more vibrant with more things going on and definitely Canton falls in to that category, and so there are now more restaurants and things to do in that part of town as well. Baltimore is often called a city of neighborhoods because that’s kind of how the city grew up, so to speak. Each neighborhood whether it centered around . . . in the old days it would be like an ethnic neighborhood, Little Italy for example and now this little areas that have been redeveloped and young families have moved in, and working couples, single folks, so there’s pretty much something going on for a night life around. The Inner Harbor area, you’ll find things few blocks away from there and then as I said, definitely consider Fell’s Point and then you might want to venture further the field. But if somebody says to me where should I go out find a nice bar maybe I could listen to some music, go down to Thames Street or Fell’s Point. You’re bound to find something you like. Chris: I’m standing in the prettiest spot in Baltimore. Where am I standing or what am I looking at? Nancy: Well, I think I have two or maybe three. My prettiest spot in Baltimore is standing atop Fort McHenry and looking out into the water because I love history and I love water. And if it’s a nice sunny day at any time of year, people are probably flying kites or they’re out on boats. Marylanders loves being on the water and people of all backgrounds buy boats and they spend time out on the Inner Harbor. They can’t bring a personal craft into the Inner Harbor but in that area around Fort McHenry and the West Channel near Locust Points, so it’s just fun to be out there and watching families do things and looking up the sky looking for seagulls and then looking out into the water and if your me, you’re imagining Francis Scott Key on that boat waiting to see what he’s getting to see the next day. So that’s one of my favorite one and my other favorite one is probably standing in the Inner Harbor people watching, looking out toward the dragon boats that I mentioned, toward the National Aquarium, because there is always something fun going on there. I’m a big people watcher and sometimes folks come down and do a little bit of the street show thing. Other times you can watch tour groups walking around maybe you eavesdrop and learn a little bit about Baltimore without having to go on the whole tour. You can see families doing things. People listening to music; occasionally they’ll get inspired and they might dance. It’s just a fun place to be. Chris: Excellent. So you’re a Navy’s spouse, so home is a little hard to define right now for you but Baltimore is I think you said that before we started recording is as much home as any place is right now. How do know when you become a local? Nancy: For someone as map impaired as I am one of the ways I know is because when my GPS doesn’t work in Baltimore, which it never does, I’m not lost, so that’s the first way. Baltimore is home because you can fit in regardless of who you are, or where you from. You don’t have to be of any particular background or persuasion to find someone like you in Baltimore. It’s a very accessible city in many ways. The city has really reinvented itself since the 1970’s when the Inner Harbor was renovated and then when Camden Yards came in. Like I’ve said before, I was living here at the time and it was like when you’re in school and old cranky principal moves away and you get a young wonderful principal in your school. The first day of school is suddenly like Christmas because it’s so different that was Camden Yards did for Baltimore really it is, and that spirit of “hey this is our city, and we love it, and we love our sports team, and we love our restaurants, we love our food trucks, and we love everything about being here.” That is spirit is really alive in Baltimore. As the history buff that I am, the other thing that draws me to Baltimore is the strong sense of being some place where part of our country’s history began and being able to walk around those streets, go to the first Catholic Cathedral ever built in the United States. Benjamin Latrobe was the Architect, so he was a very famous Architect in Washington DC as well but he also designed the Baltimore Basilica and it’s been lovingly restored to its 1821 glory. It’s a beautiful building even if you’re not religious at all, it is definitely a part of Baltimore’s history. It’s worth a walk by and stick your head in so you can see how they’ve incorporated the federal style colors that Latrobe originally chose. It’s a neat place to go. This is just a fun place to live. There’s always something going on, doesn’t matter what time of year, and you just feel like you’re part of it and not all cities are quite that welcoming. Chris: Excellent, before we get to my last three questions. What else should we know before we head to Baltimore? Nancy: You can get here in a lot of different ways and we didn’t really talk about how to get here but Baltimore, Washington Thurgood Marshall International Airport, BWR for short, is the closest airport and there’s light rail from there to downtown Baltimore, so if you really don’t want have to a car, you don’t need to have one. We have a circulator bus like they do in DC called the Charm City Circulator that’s free and takes you on designated loops through the city, so if you want to get closer to theaters, for example you can do that, and I mention the water taxi of course we have a plenty of taxi cabs, and then there’s an Amtrak Station right in downtown Baltimore too, so whatever your preferred mode of travel, you can get here. Chris: And that’s connected to the Acela line? The best of the Amtrak system, yeah. Nancy: Yes, it is. It goes up to New York and points beyond. Chris: Excellent, and I did not know that the airport was named after Thurgood Marshall, well done. Nancy: Yes, he is a Maryland native son, so there’s a really nice monument to him down in Annapolis, actually. So he did some really great things for the African American Community and of course being the first African American Supreme Court Justice, he is a very important man here in Maryland and there are lot of things here named after him to honor his memory. Chris: Excellent, and we didn’t talk about side trips but Annapolis would be obviously one down where the Naval Academy is. Any other side trips you would recommend while we’re in Baltimore? Nancy: Well, if you have a car definitely Annapolis would be my first choice and then I would continue on if you have time to Maryland’s Eastern Shore, which is another great area to visit. Definitely, the complete opposite of Baltimore in a lot of ways. Baltimore is city. Baltimore has this more urban feel to it and the Eastern Shore is a very rural, there are a lot of there are a lot of really fun small towns to go to, the waterfront life is very important there, but if you have time to spend the day out there, it’s really fun. St. Michael’s is one of the top destinations out there but also like a little town called the Rock Hall, which is really great place to go if you like fishing because there are a lot of place to charter boats and go fishing from there in the summer time and also Chestertown is another nice town on the Eastern Shore that I’ve spent on a great deal of time in, so I would definitely send you to any of those spots. Chris: Excellent and I have a fondness for the Eastern Shore and will probably have more of a fondness in three weeks when my daughter is married at St. Michael’s. Chris: Excellent, last three questions. One thing that makes you laugh and say only in Baltimore. Nancy: Well there’s two. One is HonFest. Nancy: Baltimore has its own dialect and you quickly discover especially if you’re the parent of a child that everyone in Baltimore is “hon” except little boys and they’re all “little buddy”. So, HonFest is sort of a throwback to beehive hairstyles and that type of thing. Nancy: It’s a celebration of that and so people dress up and who’s got the strangest beehive and the weirdest glasses and the most I love Lucy dress and it’s definitely only in Baltimore, absolutely and definitely in Baltimore. My other one is the Kinetic Sculpture Race is sponsored by the American Visionary Art Museum that I mentioned before that is at the beginning of May and this again definitely only in Baltimore The teams who enters creates sculpture that is people powered and can move on a street and in the water. The teams race these vehicles and the other requirement is that it must include a Sock Monkey. Nancy: And these contraptions they have various bizarre themes, the museum’s official kinetic sculpture is a giant pink poodle named Fifi. So she is part of this competition every year but anything bizarre that you can think of. Somebody has thought of kinetic sculpture that goes with that. So the race takes these kinetic sculptures on a street and through mud and through water powered by the people who are theoretically inside the sculpture and the way you win it is by coming in right in the middle of the pack. Nancy: If you come in first you don’t win so . . .
Chris: I believe that qualifies as a good answer to this question. Thank you. Nancy: Yes, only in Baltimore. Chris: Finish the sentence, “You really know you’re in Baltimore when . . . ,” what? Nancy: Well one of the ways you know you’re in Baltimore is when you look around and you are the only person not either a Ravens’ jersey or purple. Nancy: And you are surrounded by hundreds of people. We have a tradition here Purple Friday. Nancy: It does not matter where you go. Chris: For the color of the Ravens? Nancy: Yes, purple and black are their colors. Where you go, you can’t be going into the dentist, you can’t be going to have your hair done, you can’t be going to church, you can be going to just about anywhere and if you aren’t wearing purple, you feel a little bit left out, because you’re not wearing purple. I don’t have any purple gear so this happens to me on a regular basis. I think other way you would know that you’re in Baltimore is that you’re eating a crab cake and you can tell that they just made it there, that day right then with fresh crabs that came from the Chesapeake Bay and you can tell. Nancy: You can tell because the chunks of crab are really big. You can tell because it has Old Bay seasoning. We haven’t talked about Old Bay, but this is the Maryland seasoning that you put on crab everything. They even brew Old Bay beer here. It’s very popular the Flying Dog Brewery brews it and when it first came out, you could not find it. It flew off the shelves as fast as they could load it on. I am not a beer drinker but I can tell you that there is definitely a bit of Old Bay hint to it and my husband who is a beer drinker says it really great stuff. Chris: Excellent and last question. If you had to summarize Baltimore in just three words, what three words would you use? Chris: Excellent. Nancy, where can people read more about your travels? Nancy: Well, you can always read about my travels at About.com. If you go to About.com and you search for the words “senior travel” you will find my smiling face and all of the articles that I’ve written for About.com over the years. Another place that I write for on a regular basis is a website that is a community for women ages 60 and older. It’s called SixtyandMe.com. You don’t have to be 60 or a woman to read the articles there. I contribute travel articles to Sixty and Me on, as I said as a pretty regular basis, so that would be the top two places. I have a little Facebook page dedicated to senior travel as well. I do most of my writing for About.com and I put up photo tours and travel tips and things of value to the senior travel community and to people who like to get out and experience life the way locals do. Chris: Excellent, and our guest again has been Nancy Parode. Nancy, thanks so much for coming back on the show. We normally don’t have somebody comes back that often but Nancy did such a good job last time that we brought her back more quickly, and I hope to hear you again on Amateur Traveler talking about some other destination. Nancy: Thanks, Chris. It’s been a pleasure. Chris: In news this week we have an interesting story that went up about a mom who loses it when a flight attendant asks her to stop torturing other passengers with baby guppies. A mom was on a flight playing her iPod for her two year old, her two year old apparently won’t wear headphones, and so she had the volume turned up, and the flight attendant asked her to turn it down, and she refuse to do so not seeing the difference apparently between using the device with or without headphones. She got into an altercation when she was met by the security after the plane, started shouting things that like “I’m an American Citizen. I have rights, don’t I?” One of the security officers [removed] because they didn’t make her feel safe, and claimed that she didn’t need to follow the directions of the flight attendants because she was not a robot. Now the most wonderful thing about this whole story is that she didn’t think she was in the wrong and so she videotaped the whole thing and put up in YouTube and threatened to put them up on YouTube to show the whole world how she was victimized. But it doesn’t comes out that way when I look at it. When you’re on a plane you have to follow the rules, and there is not right in the Constitution to being annoying. Before we end this episode of the Amateur Traveler if you can do me a favor, we do still have some spots especially on the 15 day trip to Morocco. We have five people signed up for that if we don’t get at least eight, then actually it would cost me some money because the rate that we put out is the rate that I guaranteed based on the eight-person trip. So if you know anybody who wants to come on a 15 day trip, or even on the 10 day trip to Morocco, go to the book travel tab on the AmateurTraveler.com site, that trip again is on April of 2015. With that we are going to end this episode of the Amateur Traveler. If you have any questions, send an email to host at amateurtraveler.com or better yet, leave a comment on this episode at AmatuerTraveler.com. Remember a transcript of this episode will come up in a couple of weeks and those transcripts are again, being sponsored by JayWay Travel, who are experts in travel to Eastern Europe, so thanks again to JayWay Travel for those transcriptions. You can follow me on Twitter, @Chris2X, or join our Amateur Traveler Facebook community, and as always, thanks so much for listening.